Museums have sought to incorporate handheld devices since the 1990s, but until recently, these efforts have focused on pure interpretation and didactic content (Dowden & Sayre, 2007; Filippini-Fanton & Bowen, 2008; Petrie & Tallon, 2010; Burnette et. al., 2011). Only in the past few years have game-based projects emerged, such as the “Tate Trumps” mobile game from Tate Modern. This approach holds much promise, for games are inherently engaging, motivating, and meaningful experiences (Schaller 2011a, 2011b). However, because games require the museum visitor to also become a player in the game-world, they create significant design challenges to ensure a satisfying experience that enhances rather than distracts from the museum visit. To tackle this challenge, a team gathered at the Maryland Science Center (MSC) in January 2012. The group consisted of MSC’s Principal Investigator Jim O’Leary, a consultant and project leader (Dr. Eliene Augenbraun, MP Axle, Inc.), MSC development and implementation staff (Karen Battee and Alex Nance), and the authors of this paper: a learning game designer (Schaller) and an independent evaluator (Flagg). Supported by a grant from the National Science Foundation, the team’s goal was to design and produce a mobile game, eventually named PlanetMania, to be played by visitors at a museum exhibit about astrobiology, which was also in development at that time. The project had originated in 2004, when it focused on bringing Augenbraun’s short videos about current science research into the museum, to be displayed on large screens and small handheld devices. Over time, guided by Flagg’s formative evalutions, other research (Hsi, 2003), and the proliferation of smartphones, the project evolved into a mobile game. In contrast to a tour format, a mobile game would appeal to children (a large portion of MSC visitors) and could help them engage with the text and images of the Astrobiology exhibit (Klopfer et al., 2005). This paper offers an inside look at the PlanetMania game development, from the initial goals and concept development through the delights and frustrations of playtesting and formative evaluation to the final release and results of an in-depth summative evaluation. While this paper discusses the efforts of the entire team, all opinions and views are those of the authors. The game itself is available for iOS and Android devices from the Life Beyond Earth web page (http://www.mdsci.org/exhibits/life-beyond.html). PlanetMania’s constraints included those common to any museum project — audience and content — along with several additional constraints of platform and environment that did much to shape the final product. Scientists are looking for indicators of life beyond Earth using several scientific methods. By looking at extreme life on Earth we hypothesize about life in our solar system and beyond. The field of astrobiology is in its infancy with much yet to be discovered. This subject has a powerful appeal by connecting to innate human wonder, “Are we alone in the Universe?” However, any scientific understanding of it must be based on some knowledge of the planets, the solar system, and the scale of the galaxy, which is often wanting in our young target audience. Audience: Museum visitors between the ages of eight and twelve, visiting either with their family or school group. This audience, particularly the lower end of the age range, makes up a large portion of MSC’s visitation, but it put a significant constraint on the complexity and sophistication of the game content. Deployment Technology: Mobile devices, specifically those running iOS (iPhone, iPod Touch, and iPad) and Android operating systems. This dual-platform deployment (and our budget) meant we had to build the game in HTML and “package” it with PhoneGap, thus limiting potential interactivity to what we could produce in HTML. Game Platform: A content management system (CMS) housing all game content, so the game could be instantly updated as exhibit components changed over time. Furthermore, with the CMS, museum staff could create new versions of the game for other exhibits. This placed substantial constraints on gameplay and presentation, since we had to design a generic game format that operated independently of game content. Exhibit Environment: MSC’s Life Beyond Earth exhibit, which was being designed concurrently. This perhaps was the greatest constraint, for the game had to enhance and expand upon the exhibit content, while repeatedly redirecting the visitor’s attention back to the exhibit. If we created a game that kept players glued to the screen—normally a sign of success—we would have failed. Given these constraints, we had to relinquish what is typically a major goal for learning games: tight integration of gameplay and content. When gameplay and content are separated, essentially operating on different planes in the game, players can easily ignore the content and instead concentrate only on the game components that are relevant to successful actions and choices. Subject matter: Astronomy is highly visual, so text and images can convey a great deal of information. Audience: Children are generally familiar with card games, easing the learning curve. Technology platform: Card-based gameplay can easily be created in HTML. CMS-based game platform: Cards can serve as a generic template for server-based content. Exhibit environment: Cards can be “collected” using keycodes embedded in exhibit panels, thus drawing players’ attention to the exhibit’s different areas. This format had one other benefit, which proved to be equally essential: It was quite easy and inexpensive to playtest with children using paper card mockups. After further development, we began playtesting the game with children. Over four rounds of testing, we revised and refined both content and interactivity, all before writing a line of HTML. Then we tested again after formative evaluation of a digital prototype. For these sessions, initially conducted by project leader Augenbraun and subsequently by Schaller, we brought several dozen paper Evidence Cards (Figure 1) to an elementary school to test with students during or after school. To administer the game, we acted as the computer, showing each game interface, dealing cards, and responding to player actions with minimal explanation or interference. These playtesting sessions revealed a significant problem with the game: the connection between the content and the gameplay. On its own, the core gameplay worked pretty well. Children quickly understood the basic mechanics: collecting cards, employing wild cards, and combining cards for power-ups (to unlock a more valuable card) and to form “cases” (four cards to support an hypothesis). They did stumble on several secondary aspects that were intended to make the game more interesting over multiple rounds, so these required revision. Our foremost requirement was a set of game rules that required minimal instruction, particularly since players’ attention would be split among the game and the exhibit and typical museum distractions. Guided by the exhibit front-end analysis, project leader Augenbraun drafted card content about exoplanets, extremophiles on Earth, and the ingredients of life. During playtesting, we found that most card content was new to children, but they generally could make some sense of it, especially when they could connect it to prior knowledge. The problem arose not from their imperfect grasp of the content, which was probably typical for a science museum exhibit, but from what we asked children to do with it. The game required them not merely to understand the card content, but to do something with that knowledge: to decide whether or not the card supported the hypothesis (see Figure 2). Children made valiant attempts, but often their rationales were vague, uncertain, or even whimsical. Given their unfamiliarity with our science content, this task was simply beyond the cognitive ability of most 8-10 year olds, at least within our chosen game format. And not only them. The project team often struggled to articulate whether a card should or should not support each hypothesis. If we couldn’t decide, with our deeper knowledge of the subject and the game, how could we expect a fourth-grader to succeed at that task? So the problem was not purely with either the content or the gameplay. It was at the intersection of the two. Children could make rough sense of the card content, and they had no problem with the basic gameplay. But applying their nascent understanding of the card content in the context of the game rules proved too difficult for most children. Ironically, we had managed to create a game that required that players understand the content in order to play the game well — and that turned out to be the central problem with the game design. That, at least, was how we interpreted the playtesting results, but since the actual Life Beyond Earth exhibit was still in development, playtests were conducted in a vacuum of sorts, absent the atmosphere of exhibit panels and interactives. Thus, some of our conclusions were tentative at best, for we had to rely on the game cards to convey all astronomical content. The final game would, to some unknown extent, share this burden with the surrounding exhibitry— but to what extent this would aid children’s comprehension, we simply did not know. Nonetheless, we had to address these issues before building a pilot version of the game for formative evaluation. So we simplified both the content and the gameplay, hoping that, with a lighter cognitive load, childen could devote more attention to the evidence and the hypothesis. We then built the game in HTML to be tested in the museum. Unfortunately, “in the museum” did not mean “in the exhibit,” which was still in production. Instead, 19 children between 8 and 12 years of age played the game on iPod Touches in MSC’s Space Link gallery, as a substitution for the exhibit. A pilot who doesn’t have any fear probably isn’t flying his plane to its maximum. This pilot version of the game would also be our first test of the card-collecting mechanic, since it required the exhibit environment. To collect cards, players must find three-digit keycodes (posted at strategic spots around the exhibit) and type them into the game. 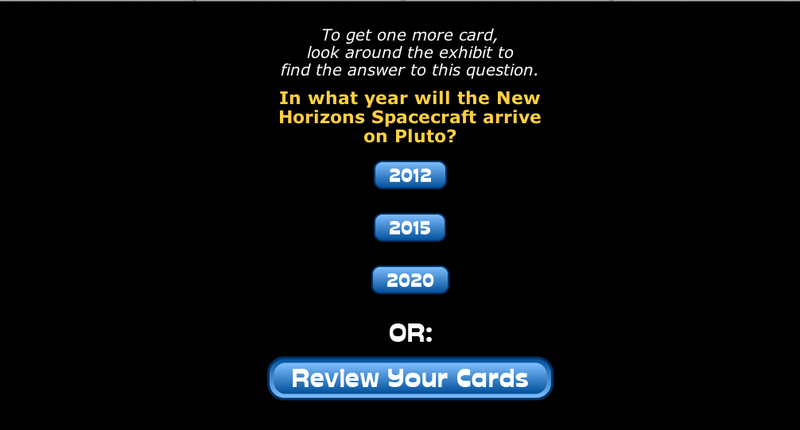 They draw two cards, then receive a multiple-choice quiz question about astrobiology (Figure 3). They must choose the correct answer (found in the nearby exhibit text) to earn a third card. We added this step to strengthen the game’s connection to the exhibit. Players repeat this process until they have seven cards in their hand. Then they begin powering-up and making cases to support the current hypothesis. The player chooses 2 Exoplanet Zoo cards and 2 Ingredients of Life cards. 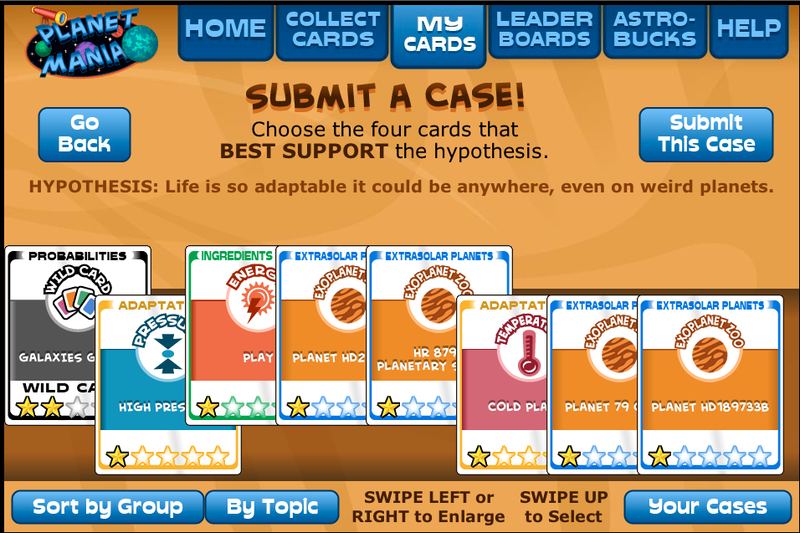 Yet when her hand was scored, this player was still not sure why the Exoplanet Zoo cards, which describe specific exoplanets, supported the hypothesis and the Ingredients of Life cards did not. This task became more difficult when we moved from paper to digital cards, and in the process added smaller versions of the cards, which were necessary given the small size of phone screens. Each card appeared full-size when first collected, then shrank to a mini-card as it slid into the card array. Players tap each mini-card to enlarge and review it — and with seven cards onscreen, this became a more cumbersome process than holding paper cards. This may have interfered with players’ ability to scan and compare the card content in relation to the hypothesis. The exhibit environment likely distracted players from the game. This was to be expected, but ultimately we hoped it would be balanced by the presence of relevant exhibit content. However, because the evaluation was conducted in the SpaceLink exhibit rather than Life Beyond Earth, there was no related exhibit content to support the game content. So, with less than two months before the exhibit opening, we drastically simplified the game design: reducing the number of card types, eliminating wild cards and power-ups, and dropping one set of cards completely. To bolster players’ understanding of the “statement” (formerly the “hypothesis”), we rewrote the quiz questions so they also served to introduce the statement. And we completely redesigned the core tasks in the game. 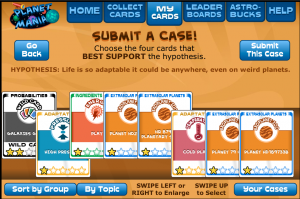 In the pilot version of the game, players collect eight cards and then choose the four cards that best support the hypothesis (Figure 2). In the revised game (Figure 4), players collect five cards, and upon collecting each card, make two decisions: 1) whether it matches the statement and then 2) whether to keep it in their two-card hand or drop it. Finally, and most crucially, instead of requiring players to infer the relationship between cards and the hypothesis, we established a simple, obvious, one-to-one match between card topic and the statement (formerly “hypothesis”). This made the matching task (e.g. “Does this Evidence Card match the statement?”) much easier for children, both in terms of understanding the task at hand and the most likely correct answer. In all, these revisions created a much simpler game, but that was also a gamble: the matching task was now so simple that players might easily make their decision based only on keywords or card design, ignoring the scientific content on each card. However, one last session of paper prototyping with schoolchildren gave us reason for hope. With six weeks left before the exhibit opened, we rapidly revised the graphic designs, recoded the game in HTML, and built the content management system that would house all the game’s card content. Adding to the excitement was one final round of tweaks, ten days before launch, based on several insightful comments by a colleague who brought a fresh perspective to the game. The game was released on the Google and Apple app stores in early November 2012. Signs near the entrances to Life Beyond Earth encourage visitors to download the game to their mobile phone (using free wi-fi signal) and play it as they explore the exhibit. After each round, their Astrobucks are added to their museum store coupon, which they can show (on their mobile device) to the store cashier to obtain their discount. However, usage to date has been modest as the museum experiments with the most effective methods of promoting the game. Do Children Play the Game? Players most often completed four rounds of the game while in the exhibit, and two-thirds stayed in the exhibit for the 20 minutes allowed (Figure 5) — though as invited visitors, they were likely to spend more time in an exhibit than an average visitor. 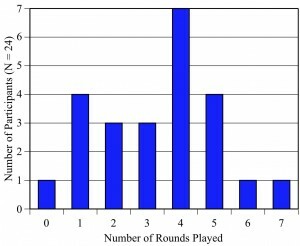 Players displayed a wide range of behaviors that fell into five patterns, defined by number of rounds played, scores, and interaction with the exhibit. A plurality (38%) of players drew on the exhibit to play the game but also explored the touchables and videos beyond what the game required, and 17% skimmed the exhibit with much less game-exhibit interaction. Some players (17%) focused only on the game, ignoring the exhibit; whereas others (13%) focused on the exhibit and ignored the game. Finally, 13% did not engage with the exhibit or the game. A common concern about game apps in a museum setting is that young visitors will become immersed in the game and miss the museum exhibits themselves. PlanetMania’s design encouraged interaction with the Life Beyond Earth exhibit via its multiple-choice quiz format. The distribution of keycodes and game questions across the exhibit’s physical space exposed users to most of the exhibit content. Three-quarters of our players interacted physically with one to six of the seven components, as indicated in Figure 6. 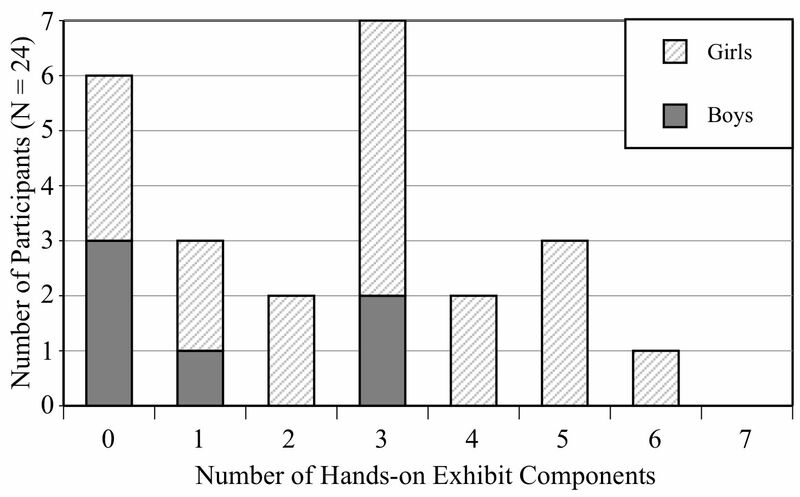 Girls tended to interact physically with more hands-on components than boys, although our male sample is very small. The summative evaluation gave us our first look at the game in action in its proper environment, where we could finally see how the much-revised gameplay worked. And to no one’s surprise, despite children’s generally positive responses to the game, two-thirds of players reported difficulty at some point in playing the game. Most of these were usability issues—finding keycodes, finding answers to the multiple choice questions, and interpreting game rules or instructions—which had a noticeable effect on player’s experience. We are currently making minor modifications to address these issues. We are also reducing each hand from five to four cards to increase the game pace and decrease repetition. However, these players’ scoring trends did not differ from other players. This may be due to the strong element of chance in the game. Players always have a 33% chance of drawing a card that matches the statement, and that may overshadow the impact of more skillful playing, especially with just 3-5 rounds of card play. Did the Game Enhance the Visit Experience? 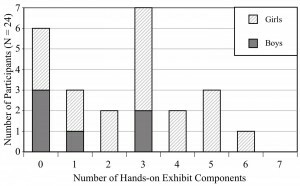 Without a study that includes an exhibit-only control group, we cannot conclude that the game experience made a significant difference in visitors’ learning outcomes, but our pre/post interviews reveal that almost all of the participants acquired some new or more sophisticated understanding about astrobiology. Moreover, children frequently specified the game as the source of their new knowledge. Table 1 shows players’ increase in knowledge on six questions related to exhibit and game content. Almost all (96%) participants acquired knowledge related to at least one interview question, 46% to two questions, and 13% of the participants demonstrated new knowledge for three of the six questions. Why do scientists think there might be life beyond earth? Describe some ways that astronomers can detect planets around stars other than our sun. What do scientists look for when searching for life on other planets? What kind of life do scientists think we might find on another planet? What things do you think life needs to survive on other planets? What are some extreme or strange places or environments on earth where you think life can be found? Prior knowledge: Water. Aliens. Atoms. Buildings. New knowledge: Liquid. Types of food sources that they might have. Microscopic life. One additional measure helps us assess the value added by the game to both participants and the science center itself: how many players use their Astrobuck coupon in the museum store. Nationwide, on average, only 20% of science center visitors make a purchase at the museum store (Museum Store Association, 2009), but 75% of families participating in the PlanetMania evaluation made store purchases using their coupons. (One parent later exclaimed to a researcher that her son purchased a microscope because he had learned that scientists focus their search on microscopic life.) Those purchases averaged about $19 per family, which is is about average for purchases at the MSC store (J. O’Leary, personal communication, January 31, 2013). Also, commercial free-to-play games typically “monetize” their game with in-app purchases for new levels and abilities. Currently, that revenue is in the range of $9.99 to $19.99 (Pratt, n.d.). By either metric, the MSC store — and game players — clearly benefit from the PlanetMania coupon incentive. 5. A Platform to Build On? 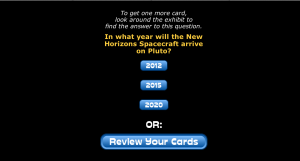 The interactive quiz and card game format of PlanetMania successfully met its goal to make the Life Beyond Earth exhibit more accessible, engaging, and understandable for upper elementary school visitors. Perhaps most notably, the game struck a good balance, as most players successfully split their attention between the game and the exhibit. This was a combination of luck and design, since we could not test this feature until the game was released. In retrospect, we learned less from paper prototyping than we realized at the time, due to the differences between the paper mockups and the digital game, along with the absence of the exhibit environment. This forced more drastic revisions after formative testing of the pilot game on iPod Touch, blunting the cost advantages of paper prototyping. In the future, we might move to digital earlier in the process and construct simple mockups of key exhibit panels to test the game in a more authentic environment. Revisions to the digital game are likely inevitable, so it’s better to discover those sooner than later. While the game was well-received, its reliance on text content and repetitive gameplay may limit its appeal. Of course, those elements are also what allow the core game platform to be repurposed for entirely different exhibits, simply by populating the game with different card content and questions. Were these design trade-offs worth it? How easily could we repopulate it with new content on another topic — and would the gameplay work as well? The only way to truly answer these questions, of course, is to try it with another exhibit. This material is based on work supported by the National Science Foundation under Grant No. 0940833. Any opinions, findings, and conclusions or recommendations expressed in this material are those of the authors and do not necessarily reflect the views of the National Science Foundation. Many thanks to the project team for an exciting and rewarding experience, as well as Dr. Ilona Holland (Harvard University), who assisted with the summative evaluation. We also appreciate comments and suggestions to improve this paper from Susan Edwards, Carole Flores, Kate Haley Goldman, Dr. Laura Martin, Susan Nagel, and Steve Boyd-Smith. Special thanks to Scott Sayre, E.D., for suggesting significant improvements to the game design. And final thanks to all the children who provided frank and most helpful feedback! Dowden, R., and S. Sayre. (2007). “The Whole World in Their Hands: The Promise and Peril of Visitor-Provided Mobile Devices.” In H. Din and P. Hecht (eds). The Digital Museum: A Think Guide. Washington, D.C.: American Association of Museums. Filippini-Fantoni, S., and J. P. Bowen. (2008). “Mobile Multimedea: Reflections from Ten Years of Practice.” In L. Tallon’s (ed). Digital Technologies and the Museum Experience: Handheld Guides and Other Media. Plymouth: Altamira Press. Flagg, B. (August 13 2012). “Formative Evaluation of PlanetMania Phone App.” Research Report No. 12-010. Bellport, NY: Multimedia Research. Hsi, S. (2003). “A study of user experiences mediated by nomadic web content in a museum.” Journal of Computer Assisted Learning 19, 308-319. Klopfer, E., J. Perry, K. Squire, M. Jan, and C. Steinkuehler. (2005). “Mystery at the museum: a collaborative game for museum education.” In Proceedings of the 2005 conference on Computer support for collaborative learning: learning 2005: the next 10 years! (CSCL ’05). International Society of the Learning Sciences 316-320. Museum Store Association. (2009). 2009 MSA Retail Industry Report. Russell, R.L. (January 2011). “Front-End Evaluation: Maryland Science Center Exhibition on Exoplanets and Astrobiology.” Washington, DC: Informal Learning Solutions. Schaller D.T. (2011b). “The Meaning Makes It Fun: Game-based learning for museums.” Journal of Museum Education, 36(3). D. Schaller and B. Flagg, Playtesting PlanetMania: A Mobile Game for Museum Exhibits. In Museums and the Web 2013, N. Proctor & R. Cherry (eds). Silver Spring, MD: Museums and the Web. Published January 31, 2013. Consulted .